M.J. Crickmore enters the MCLA Hall of Fame as an outstanding player. 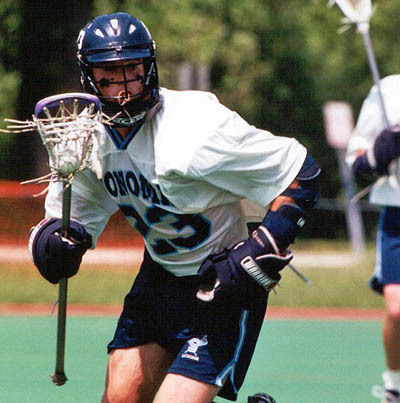 During his career at Sonoma State, he established himself as superb midfielder, earning All-American honors three times – including two first team nods. A four-year all-WCLL first team selection, Crickmore had a monster campaign during his junior season in 2002. As a First Team All-American, he led the Seawolves to their first-ever MCLA national championship, earning first team all-tournament honors and tournament MVP status. Despite missing his true junior season in 2001 (knee injury) and the 2003 campaign (studying abroad), he was named team MVP his final two seasons and captain for his senior year. In each of his four seasons, Crickmore was named to the MCLA all-tournament team. Crickmore graduated from Sonoma State in 2004 with a degree in Studio Art with an emphasis in sculpture. He is currently a fire fighter (apparatus operator/paramedic) in his hometown of Berkeley, Calif.